Show off your love for everything nautical with our nautical anklets at Gone Coastal Jewelry. Our anklets are finely crafted using the highest quality materials, including gold, silver and gorgeous gemstones, to bring you a one-of-a-kind piece of fishing jewelry that will last a lifetime. Our nautical anklets feature beautifully unique designs that you can’t find anywhere else. Whether you love fishing, sailing or relaxing on the sand, we offer something for everyone. 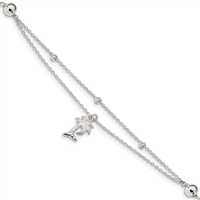 Take your time to look through our wide selection of nautical anklets. You'll discover stunning designs that feature natural stones and nautical elements including flowers, anchors, fish, boats and seashells. If you have questions about our anklets or other nautical and fishing jewelry, feel free to contact us here or call 713-927-1193 during our business hours.